"'Black Leopard, Red Wolf is the kind of novel I never realized I was missing until I read it. A dangerous, hallucinatory, ancient Africa, which becomes a fantasy world as well-realized as anything Tolkien made, with language as powerful as Angela Carter's. I cannot wait for the next installment' Neil Gaiman In this stunning follow-up to his Man Booker-winning A Brief History of Seven Killings, Marlon James draws on a rich tradition of African mythology, fantasy and history to imagine an ancient world, a lost child, an extraordinary hunter, and a mystery with many answers... 'The child is dead. There is nothing left to know.' Tracker is a hunter, known throughout the thirteen kingdoms as one who has a nose - and he always works alone. But he breaks his own rule when, hired to find a lost child, he finds himself part of a group of hunters all searching for the same boy. Each of these companions is stranger and more dangerous than the last, from a giant to a witch to a shape-shifting Leopard, and each has secrets of their own. As the mismatched gang follow the boy's scent from perfumed citadels to infested rivers to the enchanted darklands and beyond, set upon at every turn by creatures intent on destroying them, Tracker starts to wonder: who really is this mysterious boy? Why do so many people want to stop him being found? And, most important of all, who is telling the truth and who is lying? Marlon James weaves a tapestry of breathtaking adventure through a world at once ancient and startlingly modern. And, against this exhilarating backdrop of magic and violence, he explores the fundamentals of truth, the limits of power, the excesses of ambition, and our need to understand them all. 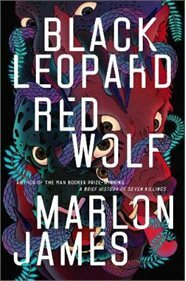 Black Leopard, Red Wolf is the first novel in Marlon James's Dark Star Trilogy."